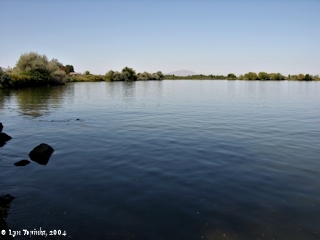 Click image to enlarge Looking upstream on the Columbia River, towards the mouth of the Yakima River, Washington. View from the right bank of the Columbia River looking back at the "estuary" of the mouth of the Yakima River. Image taken September 26, 2004. The Yakima River enters the Columbia River at Columbia River Mile (RM) 333, just upstream of Bateman Island. To the north is Richland, Washington, and to the south are the cities of Pasco and Kennewick. The river drains 6,155 square miles and contains approximately 1,900 river miles of perennial streams. It originates near the crest of the Cascade Range above Keechelus Lake, then flows southeastward for 214 miles to reach its confluence with the Columbia. The Yakima River Valley is bordered on the north by the Rattlesnake Hills Anticline and on the south by the Horse Heaven Hills Anticline. On October 17, 1805, Captain Clark explored the Columbia as far upstream as Bateman Island, just missing the mouth of the Yakima River, before turning around and returning to the junction of the Snake River with the Columbia, the location of today's Sacajawea State Park. In his journal of October 17, 1805, Captain Clark called the river both the Tapetett, and later in the paragraph the Tap teel River. On October 18 he used Tape tett. According to Place Names of Washington (Hitchman, 1984), various names of the Yakima River have included "Tapteal", "Tap-teil", "Nocktosh", "Yahinse", "Eyakama", "Eyakemka", "Yakama", "Skaemena", and the present name "Yakima". The U.S. Bureau of Land Management's 1865 cadastral survey map (tax map) of T9N R29E shows the "Yakama Riv". Bateman Island is shown but not named. The Horse Heaven Hills is an anticline in the Yakima Fold Belt, which was formed by north-south compression of Columbia River Basalt Group (CRBG) lava flows. The CRBG is divided into five formations - the Saddle Mountains, Wanapum, Grande Ronde, Imnaha, and Picture Gorge Basalts. The majority of the CRBG flows are Early Miocene, between 17 and 5.5 million years old, and were erupted from north-south fissures near the present-day Washington-Idaho border. The CRBG consists of approximately 300 thick sequences of flood basalt flows, each flow from 10 to over 100 feet in thickness, with an estimated eruptive volume of at least 700 cubic miles, making them the largest documented individual lava flows on Earth. The flows reached maximum thickness of 16,000 feet in the Pasco Basin, and in the Columbia River Gorge, 21 flows poured through forming layers of rock up to 2,000 feet thick. Concurrent with the CRBG eruptions was the folding and faulting of the basalt in the western part of the Columbia Basin, creating the "Yakima Fold Belt" of anticlines and synclines. The bottoms on the <West> South Side as high as the Tarcouche tesse is from 1 to 2 miles wide, back of the bottoms rises to hilly countrey, the Plain is low on the North & Easte for a great distance no wood to be Seen in any direction.